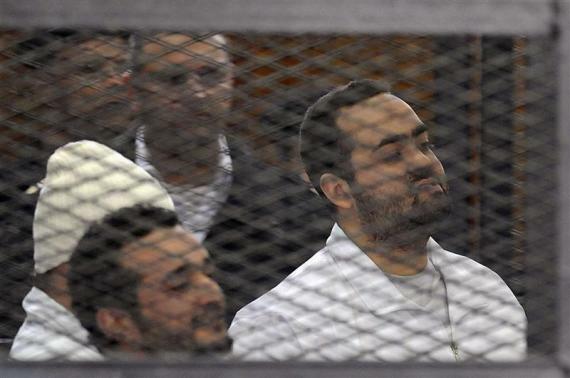 Egypt’s leading activists Ahmed Maher, Ahmed Douma and Mohamed Adel from the 2011 uprising that led to the fall of President Hosni Mubarak have been sentenced to three years in jail. They were found guilty of organizing a recent unauthorized protest. Ahmed Maher, Ahmed Douma and Mohamed Adel were arrested after protesting in November over a new controversial law that restricts demonstrations. Ahmed Maher and Mohamed Adel were founding members of the April 6th Youth Movement, which led protests to remove long-time President Hosni Mubarak in 2011. The three were among a group of demonstrators outside the upper house of parliament in late November protesting over the new law, which states that public gatherings of more than 10 people must be authorized. The men are the first to be jailed under the new law. The court in Cairo found them guilty of holding a demonstration without authorization and attacking police officers. State-run television said the men had been sentenced to three years’ hard labor. They have also been ordered to pay a $7,000 fine each. Until recently, the main targets for arrests by the authorities had been Islamists, many of whom continue to protest over the ousting by the military of the Muslim Brotherhood-backed government of Mohamed Morsi in the summer after weeks of mass protests.